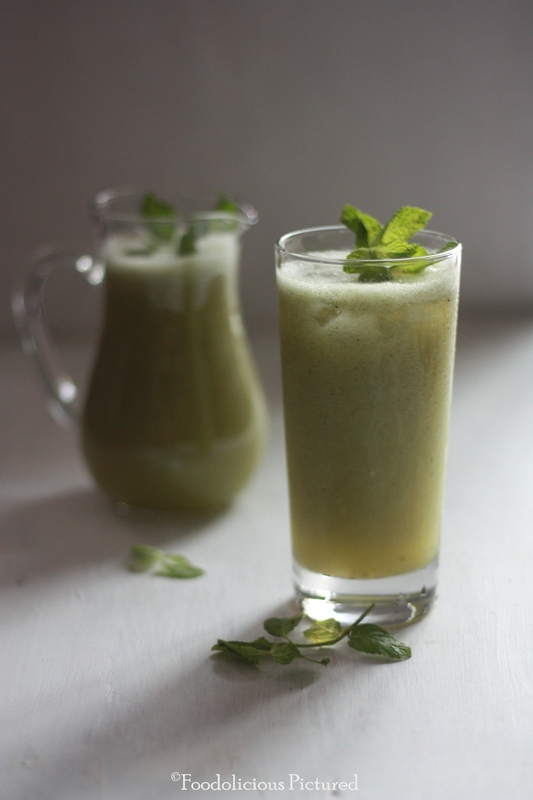 Aam Panna is considered as one of the ideal drink to beat the harsh Indian summer heat. 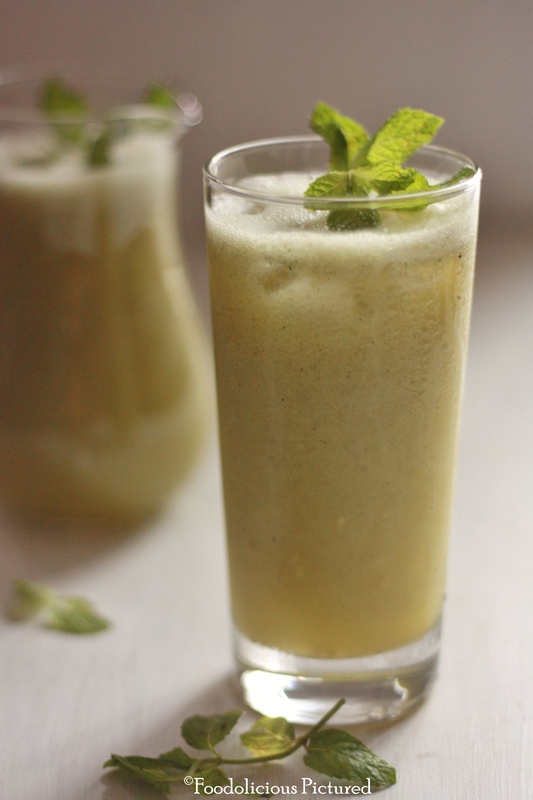 Other than the nice tangy taste of the green mangoes, the drink is known for its health benefits. 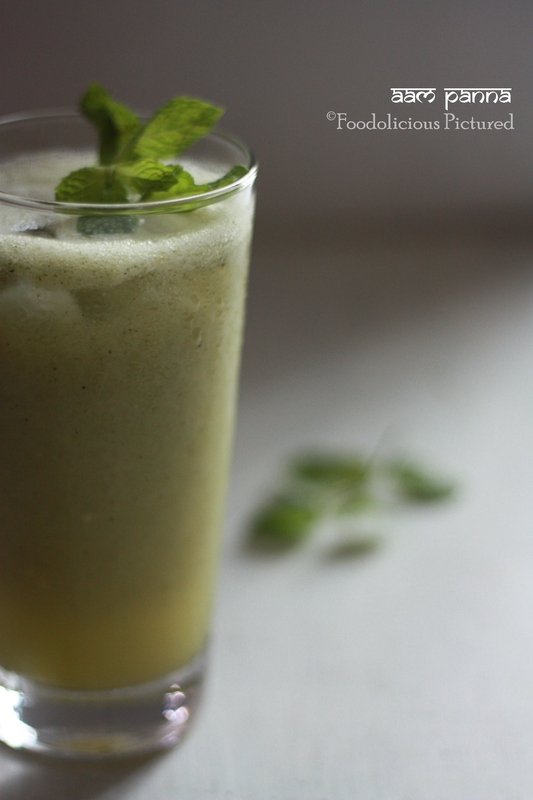 The blend of raw green mangoes, spices and sugar makes this drink ever so refreshing and delicious. The raw mangoes can be cooked either in a normal pan or using a pressure cooker. I have done the roasting with an open pan on the stove top, which gave a bit of that nice, slightly burned taste. Place the mango on the burner of your stove and switch on the flame to medium. Let the mango roast till the skin turns dark and slightly burnt. Use a tongs to turn them as they roast. Remove and cool them. Once cooled peel the skin and remove the flesh and discard the seeds. In blender place the mango flesh, mint leaves, sugar, cumin seeds. Cardamom powder, chat masala, salt and water. Blend till smooth. Check for taste; adjust the sugar and salt if required. Pour into serving glasses with ice cubes and serve. Where is the mango on burner shot that was really good. Looks like a super thirst quencher.